Levi's 505 Ladies Immersion Straight Leg Jean These straight leg jeans offer a balance between slim and relaxed fits. They have a mid rise that sits just below the waist for a fit that flatters the thigh and posterior. 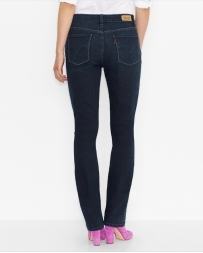 Made from a stretchy fabric, these jeans are a versatile addition to your wardrobe. 99% cotton / 1% cotton Straight leg Mid rise: sits below waist Imported.